Respawn are currently turning the Titanfall community on to the idea of ‘black market’ currency, which is a funny thing to call an developer-designed point system. Talk to Blizzard: they’ll tell you all about real black markets. In any case, players will soon be able to earn in-game cash by completing challenges or selling on unloved burn cards. But don’t call it a microtransaction system: there’ll be no means of acquiring ‘black market’ money with real-life debit cards. Black market currency can be used to buy burn cards that are a better fit for your abilities, or the titan insignia introduced in Titanfall’s last major update – emblems awarded for reaching specific goals. The market system will appear in Game Update 5, due to arrive, er, soon. Patch notes are coming next week, so expect the patch to follow in quick succession. Elsewhere in the update, Respawn are trying out Daily Challenges. 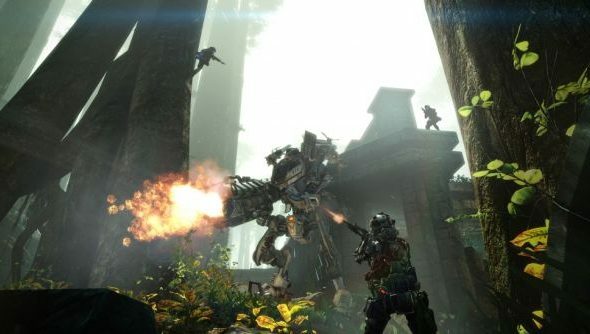 Both new ideas suggest the developers are putting their back into ongoing support for Titanfall. No sell-the-box-and-run attitude here. For PC specifically, multi-GPU support is on the way, as well as a wealth of improvements to performance, frame rate, screen tearing, and bandwidth. And somewhere around all that, three new maps in the Frontier’s Edge DLC pack. They’ll be two-parts industrial flavoured, one-part beach break. Enough to tempt you back to the dropship? The droids are still smiling, and the weather on the far side of the galaxy is lovely this time of year.